The design below left has been constructed by overlapping the perimeters of four 35.2 unit squares and no other lines were used, the squares are overlapped so that a 31.68 unit square is formed inside each 35.2 unit square. We will transform the design by making its units of measure degrees of latitude and longitude and then place the design on the surface of the earth, there are no longer any true squares or rectangles in the design but we will disregard this for the sake of convenience. We place the design so that the centre square which has dimensions of 3.52° of latitude x 3.52° of longitude has its base resting on latitude 3.52° south, doing this places the designs north and south boundaries on latitude 31.68° north and latitude 35.2° south. 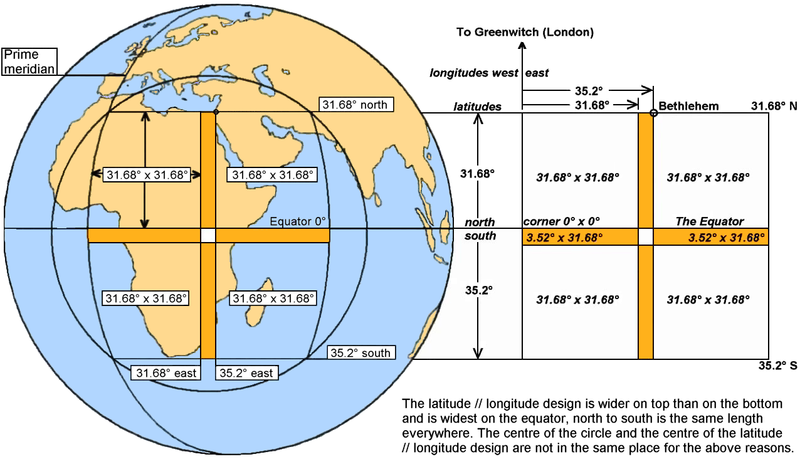 We fix the east west position of the design by placing the centre square’s east and west borders on the longitudes of 31.68° east and 35.2° east. The design below right is the same as the first design but with some lines rubbed out, the first design is the one seen on the earth’s surface below. The design reaches from latitude 31.68° north to latitude 35.2° south and is a product of Bethlehem’s 31.68° N. x 35.2° E coordinates. The central square is 3.52° of latitude x 3.52° of longitude and its base is on latitude 3.52° south. The central square’s east and west borders are on longitudes 31.68° east and 35.2° east. Each side of the centre square is simultaneously 31.68° and 35.2° of latitude or longitude from two sides of the outer square. Two sides of the North West 31.68° square lay on latitude 31.68° north and longitude 31.68° east. Two sides of the South West 35.2° square are on latitude 35.2° south and longitude 35.2° east. The outer circle below is a great circle of the earth its radius is 31680 furlongs, its diameter is 63360 furlongs, the inner circle’s 6336 mile diameter = 3168000 reeds, its radius is 3168 miles. The diagonals of the latitude longitude design are 6336 miles in length therefore the design fits tangent inside the 6336 mile diameter inner circle. 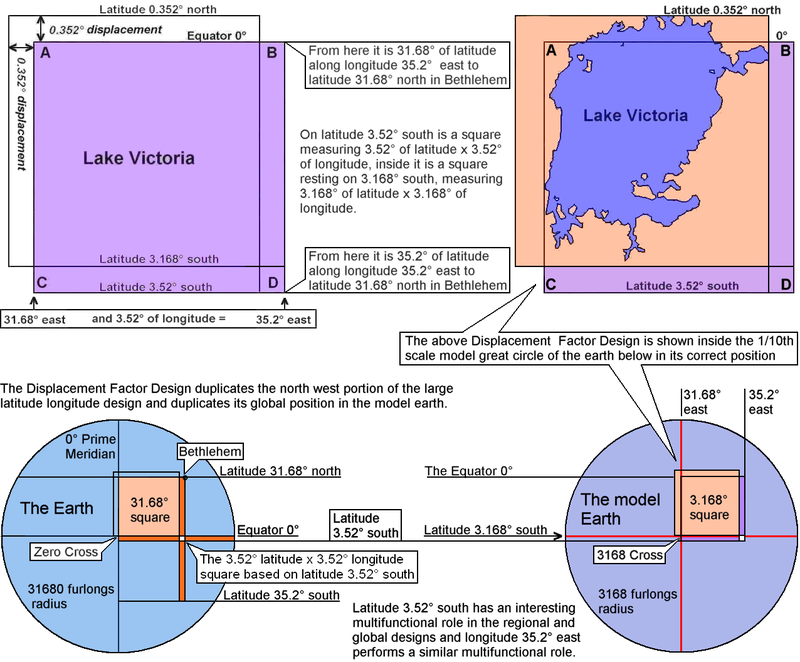 In the latitude longitude design Lake Victoria appears to be not quite in the right place, it seems that it should be completely inside the central square of the huge latitude longitude design which is the white square in the above illustrations and is the purple square below marked A, B, C and D. The Displacement Factor is not a repair job it is much more than that it is an amazing design in itself that contributes to and interacts with the larger designs surrounding it, meaning the earth model and the large latitude longitude design. We have used two overlapping 3.52° squares to demonstrate the Displacement Factor and it works like this, we have placed the pink 3.52° square around Lake Victoria and if we realigned this square and its contents with the 3.52° square based on latitude 3.52° south Lake Victoria would be perfectly placed in the centre square of the huge latitude longitude design but the cost would be great. Lake Victoria the source of the Nile would still be inside the 1/10th scale model great circle of the earth but it would no longer be contained in its north east quadrant and the existing partnership with 1/10th scale model great circle of the moon would be modified with the loss of the quadrant connection. But the main loss would be the loss of the Displacement Factor Design which produces a 3.168° latitude x 3.168° longitude square with its base on latitude 3.168° south and with its western side on longitude 31.68° east. The square is contained by and shares two sides with the 3.52° latitude x 3.52° longitude square based on latitude 3.52° south, therefore the reason the Creator did not place Lake Victoria inside the very centre of the huge latitude longitude design was because offsetting the lake produced a more interesting and superior design.